I have tried pickling herring in the past but my attempts were never that successful. Fortunately, commercial varieties are pretty common and can usually be found in the refrigerated cabinets of a supermarket’s deli section. Above, you can see a whole fillet alongside a thick slice I cut from another. 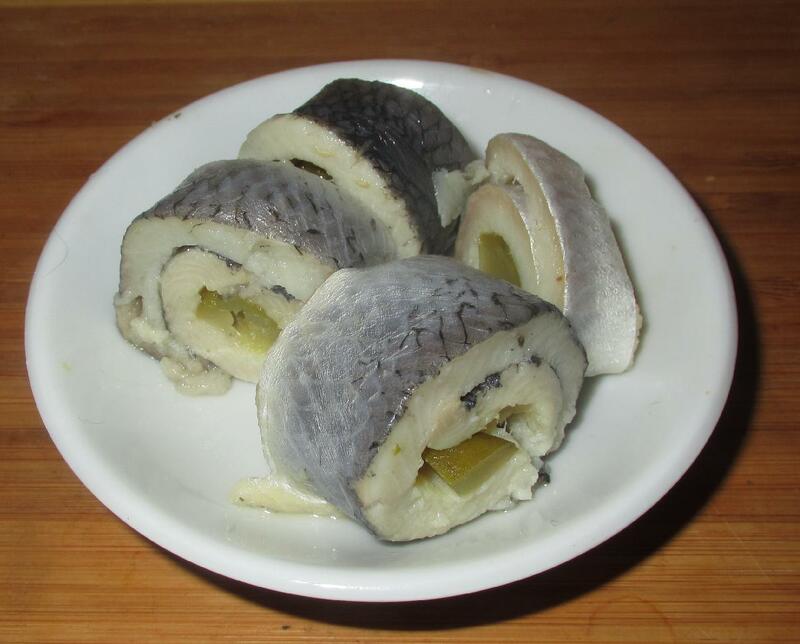 It is also possible just to buy chunks of herring pickled in the same sort of medium (and which are then not called ‘Rollmops’) and this is actually the way I tend to buy the pickles most of the time. Some people eat pickled herring on bread and butter, others with buttered potatoes, but my wife and I just enjoy the tangy, sweet fish flavor with nothing but the onion pieces from the same jar. I have an idea that the un-rolled fillets might make an interesting Nigiri Sushi topping but I haven’t tried that as yet. [laughing] I am on a supposed blog break this month, but could not resist! I am an Estonian born Aussie – thus herring is ‘mother’s milk!! I can assure anyone reading that all of Scandinavia, the Baltics, Byelorus and Western Russia could not live without the stuff just about every day. I eat matjes fillets more often than rollmops which can often be too acidic. My favourite way is for breakfast: hardboiled egg + herring on an open slice of black bread. Very common!! And talking of different modes of preparation: once having lunch at the Operakallaren smorgasbord restaurant in Stockholm, I counted no fewer than 26 different modes of preparation for raw herring! Had them all too methinks!!! Actually, that sounds like a terrific breakfast to me. I’d love to try some of the other methods of preparation! It wasn’t for ‘lack of love’ for your post, Stefan!! The ‘nuisance; will be back by the end of the month 🙂 !! The word is indeed Dutch/German. Mops is a word that is not used anymore seperately, but it used to mean something like lump or lumpy. It is now only used in compound nouns. A mopshond (mops dog) is a dog with a lumpy snout, mopsneus (mops nose) is a lumpy nose on a person, and rolmops is a rolled up herring that looks a bit lumpy. I’ve checked reliable sources to confirm. I was introduced to pickled herring by a friend from Sweden but have not gone out and buy any on my own. We always have a jar in the fridge! My husband would enjoy this dish…he has had something similar for breakfast during our travels in Germany. Like a cross between sushi rolls and sashimi. Very interesting, thank you. I love most seafood. However, I can not abide rollmops. 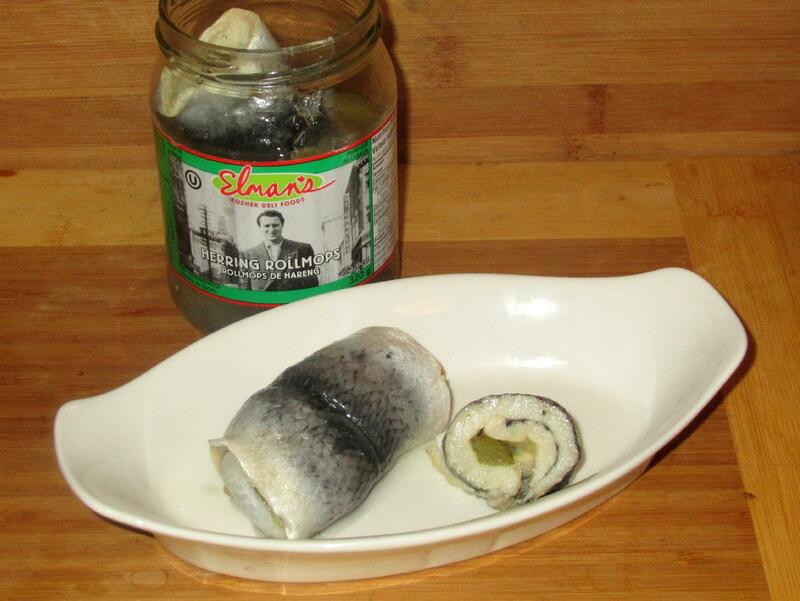 lucky you my friend, the rollmops seems fo fancy and elegant…..
never seen jarred rolled herring like this before!! !